A feast for the eyes awaits visitors to the ‘Cambridge Art Salon’ where the works of three bespoke milliners is being exhibited between 3rd May – 15th May – offering an exclusive preview of their 2012 couture collections. ‘A Piece of Magic ….. is a Hat’ celebrates the creative flair of Karen Lewis, Sandra Belgrave and Daniel Pilecki – presenting an exquisite display of designs ranging from beautifully fashioned fascinators, elegantly sculpted headpieces, – and eye-popping statement hats. The exhibition promises a dazzling array of couture creations from Cambridge Milliners – Karen Lewis and Daniel Pilecki – the former, drawing on her extensive experience of working with luxurious textiles – to produce sublime ‘jewel-like’ highly coveted hats, while Pilecki evokes the glamour of Hollywood with a series of show-stopping sculpted designs – proving imagination holds no bounds. Joined by London based designer – Sandra Belgrave with a range of city slick, cutting edge – Ladies and Men’s Hats – with her signature twist, the exhibition will have hats for every occasion – many of which will be for sale. Ladies need look no further if seeking inspiration for a head-start in this summer’s fashion stakes. After studying fashion and then textiles at Cumbria College of Art, Karen went on to create her own work, culminating in amillinery course at Kensington and Chelsea College under the guidance of Noel Stewart. Her collections have been inspired by many different themes such as fossil drawings by Ernst Haeckel, natural floral forms and garden architecture. 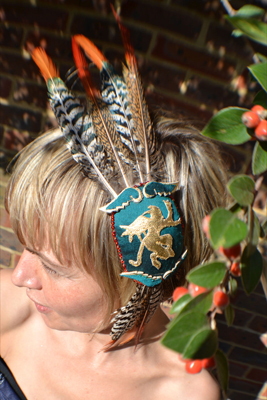 Karen specialises in manipulating fabric and creating unusual textures to form her headpieces. She uses traditional materials such as sinamay, crin and felt, and also source silks, ribbons, buttons, feathers and anything of interest from vintage shops and markets in London and Paris. On Karen’s well-established millinery blog, the reader can discover what inspires her work. 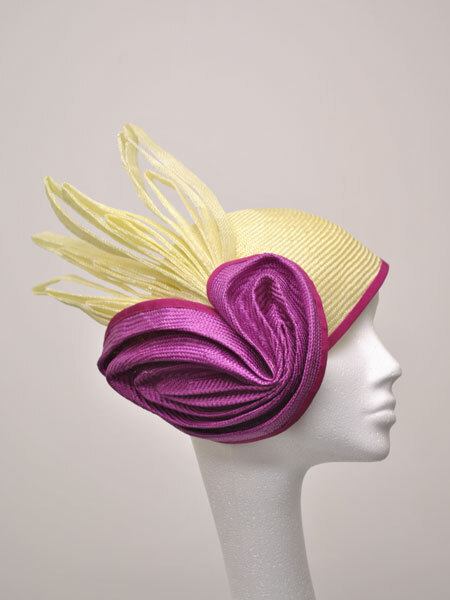 Sandra Belgrave is a designer who creates high quality bespoke hats and couture headpieces. For years, she has worked as a designer in Digital Design, jewellery and theatre design, as well as a photographic retoucher for fashion photographers and the animation industry. She then moved into the world of millinery, after studying and qualifying at Hortensia College in Chelsea under the guidance of internationally famous milliner Noel Stewart. Sandra specialises in contemporary hat designs to suit the elegant, sophisticated and stylish woman. Her unique creations are hand-made, using an extensive colour palette of rich felt, feathers, materials and zips sourced from around London. Every beautiful hat or headpiece is a celebration of exceptional craftsmanship and outstanding quality. After studying Drama, working as a TV Researcher and Location Director in London and Paris for a Japanese Fashion TV programme and making performance art ‘props’, Daniel decided to turn his passion for millinery into his profession. He went on to study at Kensington and Chelsea College under the tutelage of Noel Stewart. When working on his unique creations, Daniel uses peachbloom felts, straws and sinamay, luxurious silks and satins, sumptuous velvets, leather and metal, antique lace and veiling, feathers and quills, beading and semi-precious stones. Some of his work features oriental pleating and folding techniques; an eye-catching fusion of East and West. Every piece of headwear is an individual, hand sewn work of art, to be loved and admired, worn and enjoyed. An unshakeable belief that women should look beautiful in his pieces underpins each of his creations.